Most of the time we use a lot of software to record, cut, mix, add effects and a lot of stuff to achieve a good result for our records or any vocal file no matter what contain, but it's complicated to use a lot of software to do that, instead you can use only one good software to manage any audio file in your computer easily, to walk with you through that, i'll suggest you 8 awesome features you can find it in one software, AV Voice Changer . Ok, let's start with the greatest feature in the software, i'm so excited about it too, when you open the software and start using it, you can select " Microphone Av Voice changer " in other recording or talking software like skype, then you can real time changing your voice with awesome effects, you can talk as Men, Women, Chile, Baby, Old ... , this feature is unbelievable , and very helpful as well . well, we can find this feature in any record software isn't it ? well yes, but Av Voice Changer is a little bit different, instead of recording your software then edit it and add effects to your records, AV Voice Changer can do that while recording your vocal, yes you can completely manipulate the way you want your records to be while you're recording it, not after that, it's a good feature to setup a way that you like your voice to be, and then save it for later and use it as default way each time you want to record a voice . its help you manage any record as fast as possible, the software AV Voice changer contain a bunch of existed effects, you walk through them at the first time you install the software to check them all if you want, then select your favorite effects and save them, then use them on your records or audio files and apply effects on them, so you can finally get a good audio file satisfy your needs in simple steps . or you can call it Voice beautifying, a small tool in AV Voice Changer that help you customize your records or audio files as you want, it consist of 4 main elements that you can play with or change them until you get the perfect audio you want, furthermore, you can save or load the result so you can use them on other audio files later . 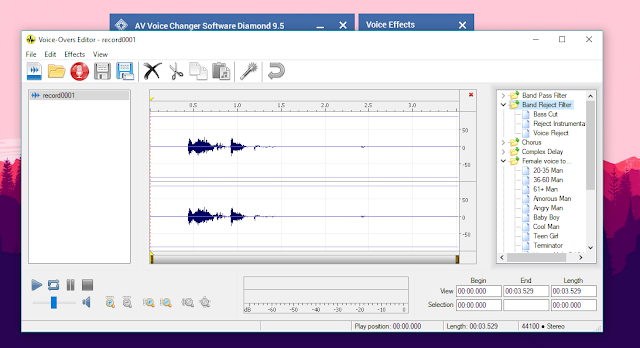 before we continue the features of AV Voice Changer, let me clarify the the software is very lite, i used to use heavy software to do the exactly the same things that AV Voice Changer like : Adobe Audition or Ashampoo music studio, but AV Voice changer can do the same things too, not only that, the software is very simple, with a clear UI to use, and very easy to use, a half hour is enough to be a pro in using Av Software Changer, try it and you'll see . once you hear " AV Voice Changer " you're probably say that is just changing voice nothing more, but actually it's much more than that, let's take a look on Voice-Overs Editor, an awesome tool and feature in the software that let you record voice-over, enhance them and make them clear and loud, if you don't like your voice, or your voice sounds silly in recording process, you can select from tools in the right some effects to add to enhance your voice-over, then save your audio and use them in your videos . 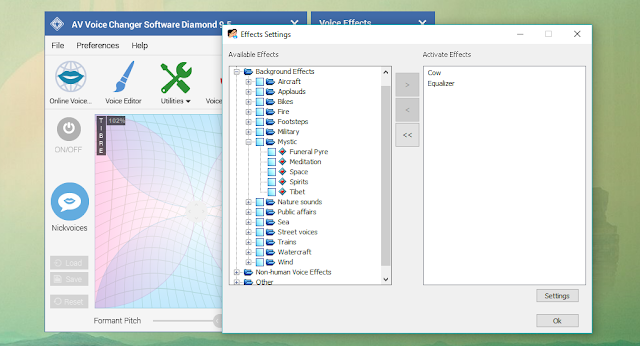 here is a great tool you can find in AV Voice Changer, we all know that audio files have extensions and formats, some of them are lite, or clear, or big and so on, and probably your are not able to control the quality of your audio, or format or clarity as well, until the File Morpher come, a great tool to convert audio files to any format you want ( ogg, wave, mp3 ...), also, there's some software out there that can't accept specific audio format, this tool can solve that problem for you . 8 - did i tell you about " Background Effects " ? i told you before that AV Voice Changer have a lot, like really a lot of effects, but i didn't mention the background effects . Yes, you can setup yourself in a building catching fire, or in the forest fishing, or in military serving your country, those background effects work on background while you are recording, you can add them to your record to achieve a specific kind of voice narration, easy to use, and simple .